Aha! The proverbial “teachable moment”. I went back to my office and got an insect net. Back outside, I netted a wasp and reached into the net and grabbed the wasp. The workers gave me a quizzical look, like, “What are you? Nuts?” But I explained to them that this was a male cicada killer wasp — and that male wasps (of any species) do not possess a stinger. I then had each of them grasp the wasp and then take a close look at it. “See? No stinger”. They were relieved to know that they could work carefree and would not be on the receiving end of a painful sting. So, yes cicada killer wasp activities are in full swing. Already long-gone are the periodical cicadas (well, “long” depends upon how one defines long). So how will cicada killer wasps survive? They will rely upon their yearly supply of “annual cicadas”. Currently, two early-summer species are singing away. I heard my first Tibicen pruinosus the evening of June 24, and first T. lyricen mid-day on July 2. 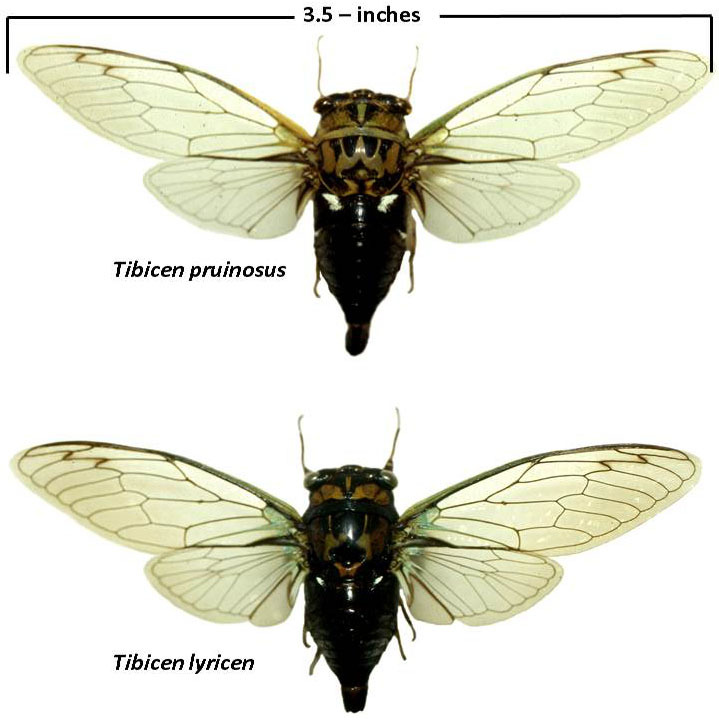 In comparison to the recent periodical cicadas, both of T. pruinosus and lyricen are larger and thicker-bodied with impressive wingspreads. Both T. pruinosus and T. lyricen are tree-inhabiting species. But side-by-side, they are visually inseparable based upon their individual distinct body patterns and coloration. By far, T. pruinosus surpasses T. lyricen in terms of population levels, their wider distribution in Kansas, and their longer period-of-activity which extends well into Fall (T. lycerin’s “run” is completed by mid-August). The familiar ZzuhWhee ZzuhWhee ZzuhWhee ZzuhWhee (typically beginning in the late afternoon into the evening) is the most familiar sound heard coming from high-in-trees in cities and towns throughout Kansas. There are many types and species of wasps. Vespid wasps (including the familiar paper wasps, yellow jackets and baldfaced hornets) live in “colonies” consisting of a single egg-laying queen and her attendant female workers who will defensively protect the colony against intruders/people who (even if) accidentally disturb the nest/nesting site. In contrast, sphecid wasps (most familiar and recognized are mud daubers which build “mud nests”) are solitary species with just a single female tending her nest. Sphecid wasps are docile and unlikely to sting unless provoked by being carelessly handled or accidentally stepped on. Thus, cicada killer wasps (despite their appearance and large size) are nothing to be feared. The female uses her stinger to paralyze a cicada. The cicada remains a “juicy” (as opposed to becoming dried out) food source for the wasp larva. 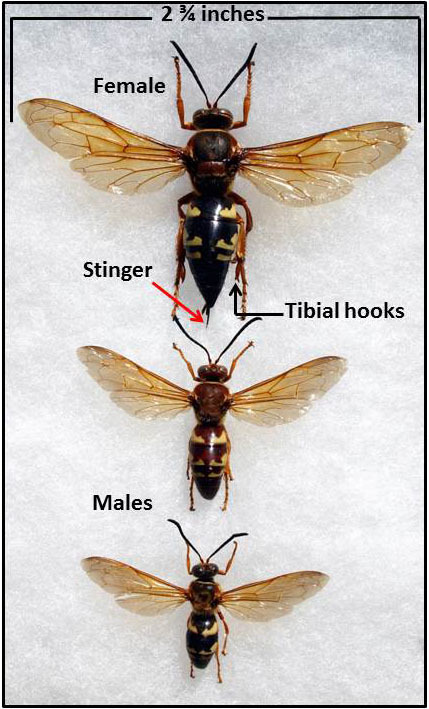 Male cicada killer wasps do not possess a stinger (as already mentioned above). Never-the-less, they appear menacing due to their erratic swarming as they establish territories and seek female mates. While occasionally one might accidentally bump into a person, it is not “attacking”. Once a male has established his own small territory, he will be on active patrol protecting against interlopers. Buzzing about, he may hover and circle a person. While this may be intimidating, again, he cannot sting! 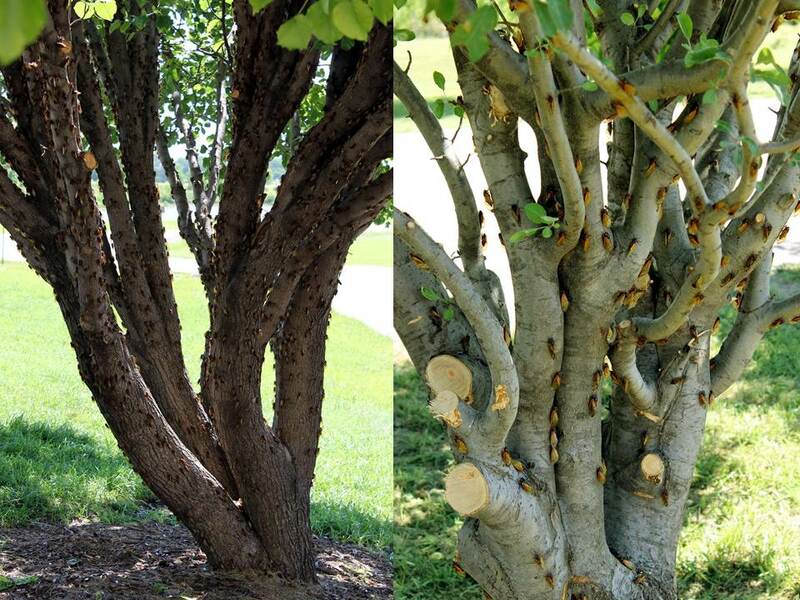 Cicada killer wasps have a 1-year life cycle. Whereas males do little more than mate, you have to admire female cicada killer wasps —– they do all the work. She selects a preferred site (often a bare sandy area) in which to construct her burrow. Nests are 8 to 20-inches underground. Using her mandibles and legs, she digs/loosens/”kicks out” soil particles which results in the creation of a dirt mound at the burrow entrance. There is a central tunnel off of which are separate side cells/chambers. After the structural completion of the nest, she begins the provisioning process. Each chamber contains a single-to-several paralyzed cicadas. After depositing a single egg, the cell is sealed off with dirt. Within the cell, a newly-emerged larva feeds and matures. 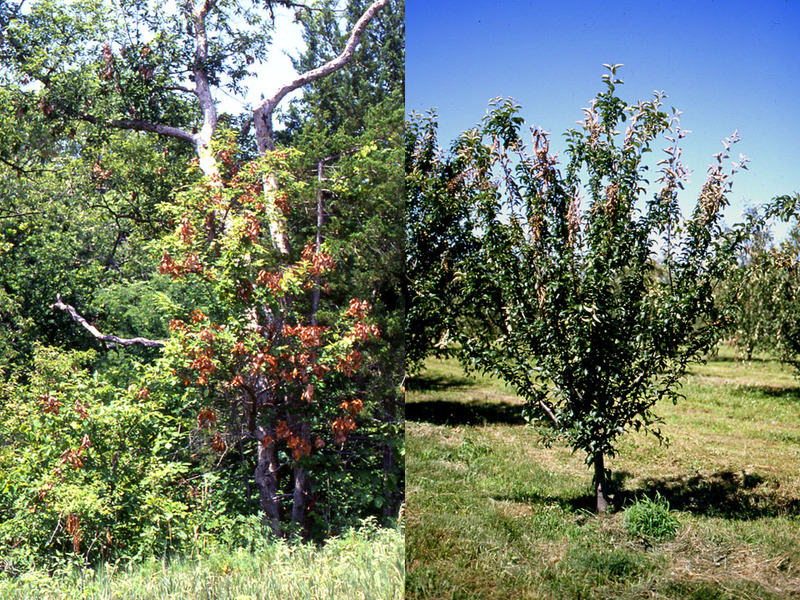 By mid-summer, it forms a cocoon inside of which it spends the remainder of the summer, the fall and winter. In the late spring, the larva pupates. 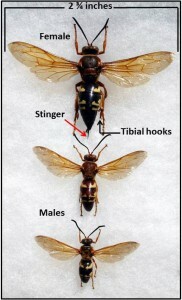 “New” cicada killer wasps emerge in early summer, mate, and repeat the cycle. It is not coincidental that nesting areas tend to be close to wooded areas. 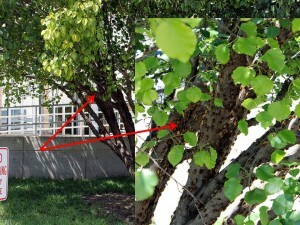 Given that many cicada species are arboreal, trees are ideal sites for locating cicada hosts. Another advantage of trees? They provide a high point. That is, because a cicada far outweighs the female cicada killer wasp, she is already high enough that she can spread her wings and be airborne. Should she fall short of reaching her nest, and because she cannot take off from the ground with her heavy “cargo”, she will drag her cicada up another tree (or some other convenient high point) to again become airborne. The last part of her journey may be on foot when she is close enough to the nest entrance. She then drags her captured cicada to the entrance of, and into the burrow. This process is repeated time after time after time after time until all of the chambers are provisioned, eggs deposited, chambers sealed and the burrow entrance closed. A point of interest: females use their middle pair of legs to wrap around/hold the paralyzed cicada. Furthermore, the tibia of the female’s hind legs possesses a pair of hook-like appendages (see image above) used to hold/maintain the cicada parallel to its body when in flight. In an experiment where those appendages were removed, the middle legs still secured the cicada although it dangled beneath the wasp as she flew. Comes the question, “How do I get rid of the cicada killer wasps around my house? I’m worried about being stung!” If you have read through to this point in this article, you already know that you need not be overly concerned about, “….. being stung!” But still, if there is the desire/need to do something, the best procedure would be to observe and identify where the nest openings are. Wait until the female departs. Between that time and when she returns, apply an insecticide into the entryway. 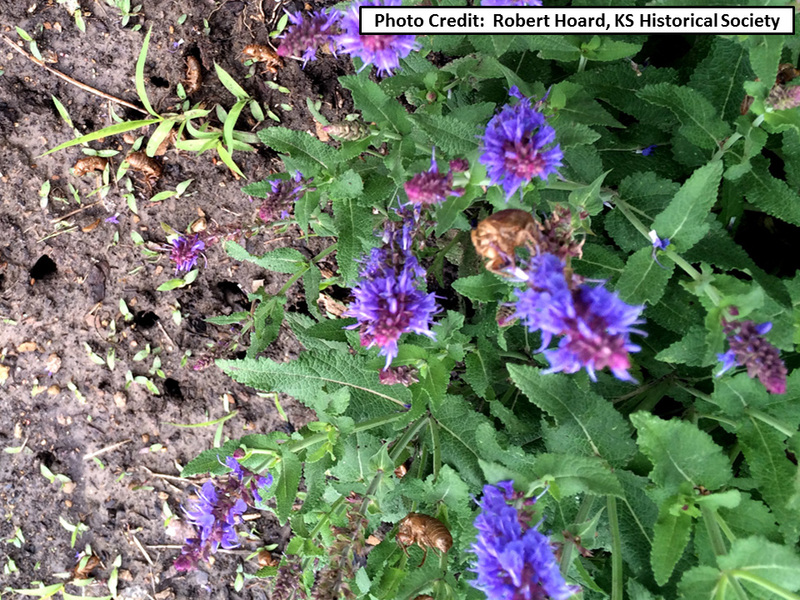 (There currently are 795 different products registered for use in Kansas against wasps. Shop-the-shelves at local retail outlets for product availability in your area.) When the female wasp returns, contact with the insecticide will probably lead to her eventual demise. Whether the insecticide will kill the developing larvae is questionable as they are protected by the dirt wall closing off its underground incubation chamber. The practicality of the above? One or two mounds/nests? Doable. Many mounds/nests? Probably impractical. It is up to an individual’s best judgment as to what to do. But maybe consider altering “the attractiveness” for next-year’s bout. Renovate lawn areas —- restore a thick vigorous turf which would have females searching elsewhere for a thin/bare area in which to raise her brood. 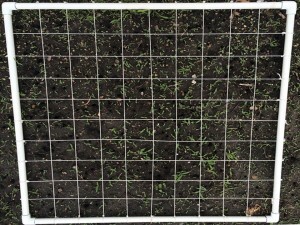 Also, maintain a moist soil as that would tend to deter her from wanting to expend maximum excavation efforts. In flower bed areas, a layer of gravel or mulch may dissuade her from setting-up-house. Probably the most famous flood resulting from a broken dam is the Johnstown Flood. Doubtful that such could ever happen again given that “oldtime” dams were not constructed like modern day dams, and communities would not be put in potential paths-of-danger. I don’t know all of the details, but extensive rains added to the waters behind the dam building to the point that the dam could no longer hold back the waters. The dam burst and the deluge of water swept down and flooded the town (Johnstown, PA) downstream. So again, stretching-the-rubberband-thin (as I often do): periodical cicadas. Eleven days ago (as I now write this), I observed and collected my first periodical cicadas — one here, one there, and so on. Pretty quiet. Four days later, I drove a gravel road with windows down —- listening listening listening. In fact I would stop (to eliminate wheel noise) to listen. And even shut the motor off to listen. I would pick up cicadas calling from certain groves. Three days later, the dam had burst. That is, with windows down and driving 60+ mph, the wind blowing in my ears and the hum of the tires on-the-pavement road were not enough to drown out the LOUDNESS of periodicals from both sides of the road. Also, more and more people have become aware of and reported periodicals now that (probably) the greatest percentage of their emergence has occurred. While I have taken images of what I thought were impressive numbers of periodicals, nothing compares to those which I received from Ron Embry/Sarah Jaster at the Webster Conference Center, Salina, KS. This brought to my mind an acronym that I use on occasion: TMTC = Too Many To Count! While not useful for inserting into any formula for purposes of scientific statistical analyses, it serves to satisfy me in terms of relating uncountable numbers. You be the judge. Whereas the current cool weather and rains have been a boon to farmers and stockmen (think wheat and farm ponds) across the state, the explosive emergence of Brood IV periodical cicadas has yet to happen. I have visited several sites in and near the Manhattan area —– all has been silent. I have received a report from Robert Hoard in Topeka where (as he arrived at work) last Monday, May 18, he noted emergence holes and cast skins (exuvia) in a flower bed next to his parking lot. The likely scenario is that the periodicals emerged some evening(s) between Friday through Sunday when daytime temperatures were high 70’s and low 80’s. Although he has yet to see any adults, they are likely nearby, lying low, perhaps hidden in and under the dense plant foliage. 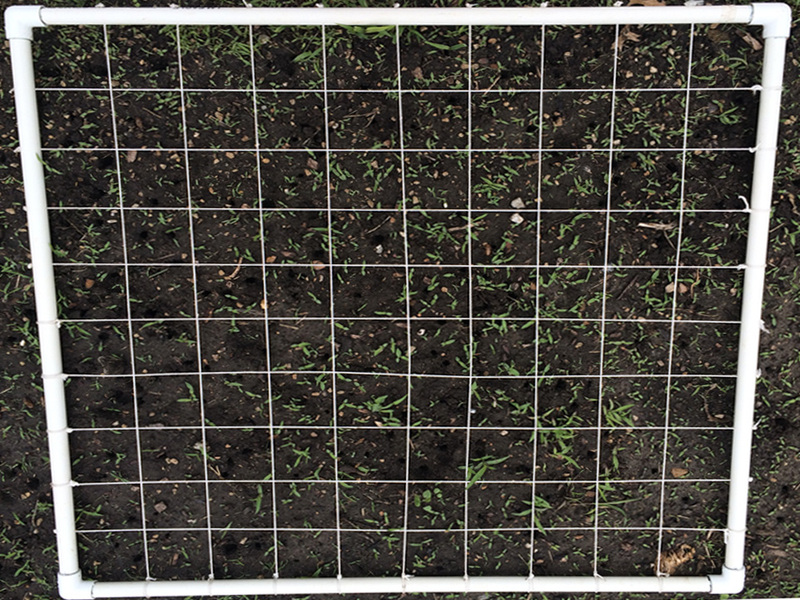 In order to somewhat quickly determine a rough estimate of numbers of emerged periodicals, Robert placed a 1 m2 grid over a portion of the flower bed —- counting 53 holes over a smaller sub-grid area. It will be interesting keep this area under observation to see if what initially emerged was just the tip of the iceberg for the 1 m2 area. (This image can be greatly enlarged should you choose to do so — an exercise for making a full count. 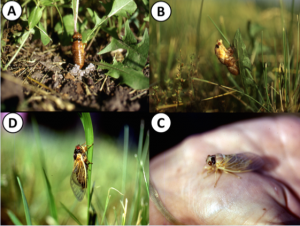 An extrapolation could then be performed to obtain the estimated number of periodical cicadas per/hectare —– or if to be more meaningful, convert to a per/acre basis). Looking at the projected mid-to-high 70s/low 80’s for Memorial day through next Saturday, periodical cicadas should begin popping out like popcorn in a popcorn maker. I would appreciate my phone ringing off-the-wall (yes, still a land-line user —- 785-532-4752) as well as e-mail messages (rbauernf@ksu.edu) reporting periodical cicada activities. I would especially be appreciative of reports from the counties in yellow, orange, blue and pink. Algebra? Trigonometry? Calculus? Not my strongest subject matter. Never was — never will be! But simple math, I can handle. 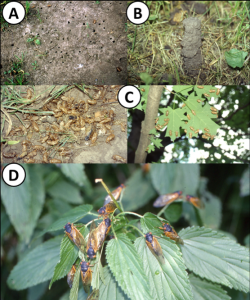 The answer of “17” can only mean one thing to an entomologist: 17-year periodical cicadas. 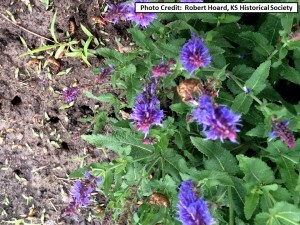 By the end of May and into June, the “buzz” created by massive numbers of newly emerged periodicals will create quite a “buzz” mainly amongst citizens of eastern Kansas. With their distinctive appearance (black body, blood-red beady eyes and orange-veined clear/transparent wings), there can be no mistaking periodical cicadas for any other insect. In actuality, the simple above-mentioned descriptors are (for lay people) not utilized in taxonomic keys used by systematists to identify/classify cicadas. Whereas there is a tendency to lump/consider periodical cicadas as “one”, there actually are 3 separate species of 17- year periodical cicadas. 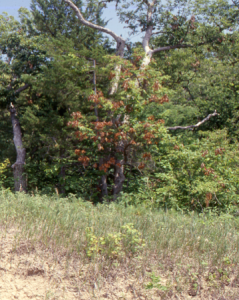 Only Magicicada cassinii and M. septendecim have been officially documented as occurring in Kansas. If one wished to differentiate which is which, the body of the smaller cassinii measures .8-inch long with an abdominal width of ¼-inch, whereas the more robust septendecim measures 1.1-inches in length with an abdominal width of 1/3 – inch (quite evident if comparing specimens side-by-side). If not wanting to take measurements, simply flip the specimens over and examine the bottom of their abdomens: cassinii is entirely black whereas septendecim is orangish. Although discernable but a little more difficult to observe is the area between the eye and base of the forewing: black for cassinii and orangish for septendecim. All this being said, by far, cassinii are more common and likely to be encountered than septendecim. 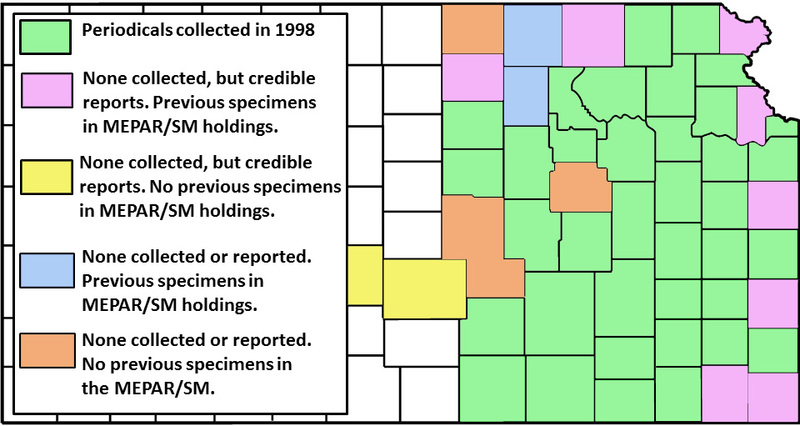 Of the 4,437 periodicals that I collected from 37 counties in 1998, 98.7% were cassinii. Without seeing an actual specimen, one can discern whether cassinii or septendecim are present. That is, the call produced by cassinii is a continuous somewhat high-pitched buzzing possibly with come ticks interspersed, while the call of septendecim is a more hollow “weeeee whoa weeeee whoa ………..” (sometimes people say it sounds like “pharaoh ……”. Only males are capable of calling/chorusing —- the purpose being to attract females for mating purposes. Probably the main complaints lodged by people against periodical cicadas have to do with the appearance of emergence holes in the ground (A), occasionally mud turrets produced by nymphs prior to their emergence (B), large number of nymphal exuvia (“skins”) from which adult cicadas emerged (C), and the noise created by the clusters of congregated males (D). Also, the egglaying activities can kill tips of branches thus causing the appearance of dead branch tips, which is but an aesthetically brief and inconsequential event. 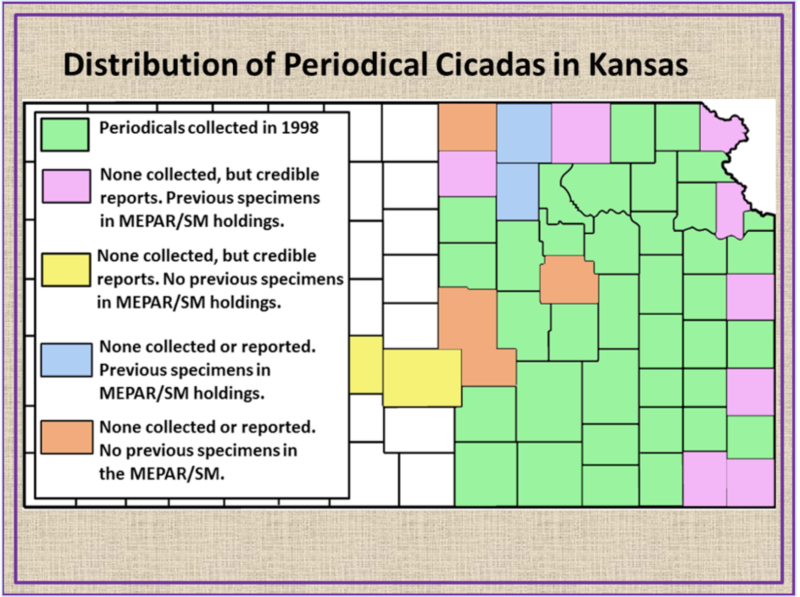 The following color-coded map details the documented distribution of periodical cicadas in Kansas. I would appreciate receiving any reports of periodical cicada activities that you encounter —— Phone: 785-539-7510; e-mail: rbauernf@ksu.edu. Of special interest to me would be reports from Morris, Republic, McPherson and Harvey counties. 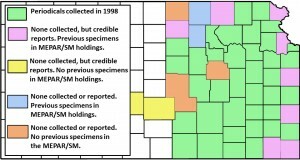 I would visit those counties/sites for the purpose of collecting specimens for incorporation into our Departmental MEPAR holdings. I plan on visiting specific sites in Reno and Stafford counties (where periodicals were reported in 1998) for collection purposes. 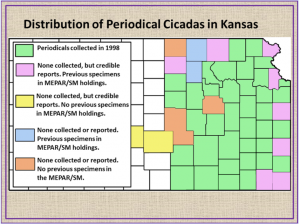 And I would especially appreciate reports from “uncolored/blank counties” for the purpose of possibly determining the western range of periodical cicadas in Kansas. All this being said, the 2015 emergence of Brood IV periodical cicadas (which includes portions of Iowa, Nebraska, Missouri and Oklahoma) was initiated in 1998 when 1st instar nymphs hatched, dropped to the ground and burrowed in. 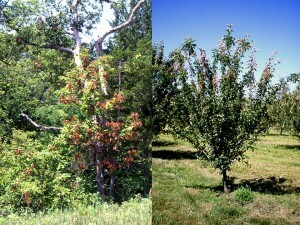 During the past 16 years, they fed by inserting their piercing sucking mouthparts into the xylem tissues of tree and woody shrub hosts. The now fully-developed 5th instar nymphs currently are waiting for soil temperatures to reach the proper temperature (cited to be 64oF) which signals them that the time has come that they should emerge from their underground habitat. After emerging (A), the skin down its back will split, and a “new adult” will emerge (B). Initially it will be white and soft (C). Over the next several hours, it will darken and take on its characteristic coloration (D). However, the exoskeleton will still be soft. An additional 4-5 days will be required for the exoskeleton to harden. It is at this point that cicadas will take flight, males will call, females will respond and mating will occur. The female then will use her serrated ovipositor to slice into and create cavities in twigs into which she will insert up to 20 eggs. She will repeat this activity as many times as is required for her to deposit her full complement of eggs which may total up to 600. Six to 10 weeks later (a time at which all of the periodical cicadas will have died), the newly hatched nymphs drop to the soil burrow into the ground, feed for 16 years and reappear/emerge in 2032!